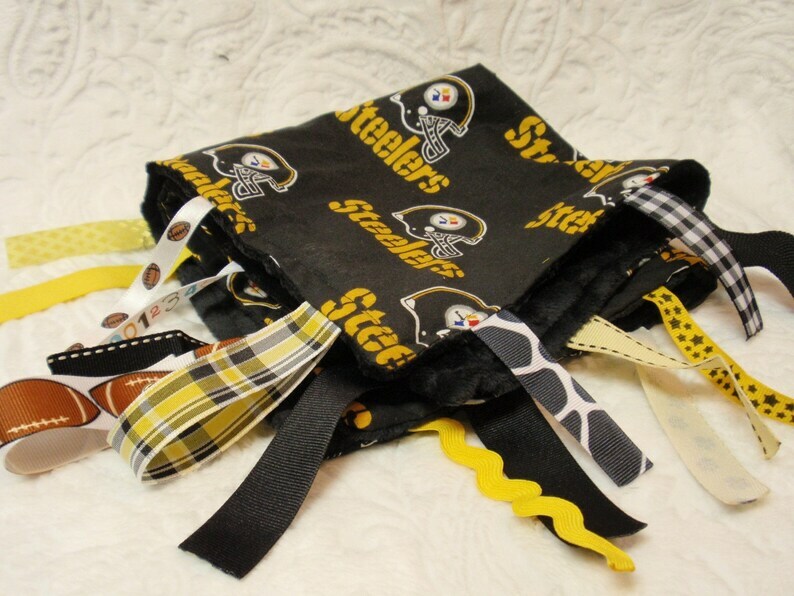 Are you a Pittsburgh Steelers Football Fan??? This little blankie is about 13 x 13 inches and has an assortment of ribbons sticking out of the sides. This is great for kids and babies to play with or snuggle on. There is one loop on the corner with a snap so that you may attach a toy, or attach it to a car seat or stroller. One side is black minky dot fabric and the other is a black cotton with the Pittsburgh Steelers logo. The ends of the ribbons have been heat cured to prevent fraying. I can add a pacifier attachment to one of the ends if you would like, please let me know when you are checking out if you would like one added (at no additional cost). I can make coordinating blurp cloths and bibs, just convo me! I can also make larger blankets too.